Each hanger has 13 loops for scarves, hand towels and other dorm accessories in a cute flower design to add to dorm room decor! Scarves, belts, leggings and other dorm essentials are incredibly hard to store, especially in a way that doesn't detract from dorm room decor and result in every dorm necessity you tried to store ending up in a heap on your dorm room closet floor. If you have a lot of scarves and leggings you may find that you found the perfect dorm storage solution for them but as you use your leggings and scarves, they end up in a messy heap. This problem will become even worse in a small college dorm room. You don't want to put those delicate dorm items away in a dorm dresser drawer where the fragile fabric may catch and create a hole in your scarf or leggings. You may then decide to just let those dorm essentials be in a heap on the closet floor where they will fall anyway, but there is a dorm organization option for them! 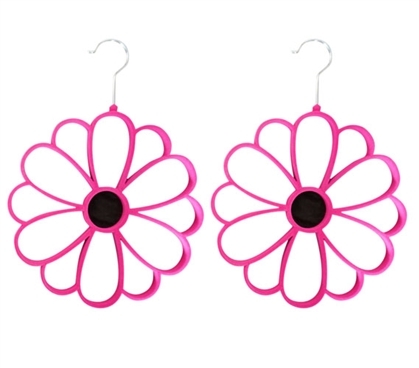 Stay stress free and keep your dorm essentials organized with our 2 Pack Flocked Scarf Hanger in a Hot Pink Flower Design! These Hot Pink Flower Scarf Closet Organizers are perfect to hold plenty of scarves, belts, leggings, and more! In a two pack of dorm hangers, each dorm organizer holds 13 scarves or other dorm accessories. Yes, that's 13 dorm items per closet organizer! Plus the smooth plastic will keep your fragile scarves and leggings in their original good condition so you don't have to worry about the fabric catching on a rough piece of wood in your dorm dresser drawers. 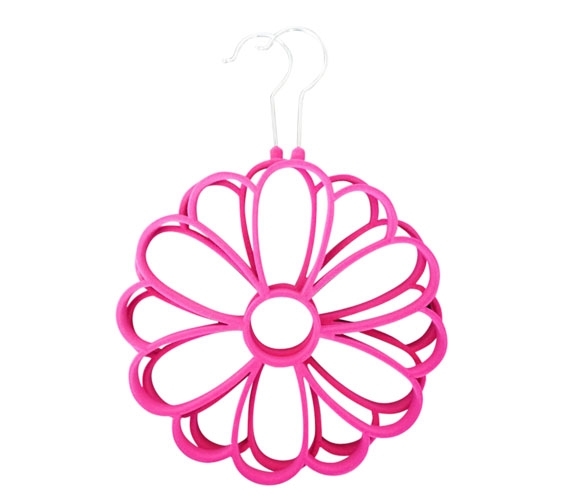 Keep your dorm essentials stress free and damage free by keeping them organized in our compact Hot Pink Flowered Scarf Hangers!